With the Queen of Hills receiving a good snowfall, the prayers of hoteliers seem to have been answered though normal life has been thrown out of gear as vehicular movement and supply of essential supplies was severely affected. Fruit growers are a happy lot as the apple belt in the Shimla region recorded the heaviest snowfall in January in the past six years, raising hopes of a good crop. However, power generation in the state plunged to the lowest level as the discharge in rivers and streams declined sharply due to extreme cold conditions. Snow finally made its presence felt in Chail and other places like Solan, Barog and Kasauli after a gap of several years though this led to a disruption in the power and water supply in many places. The state is celebrating World Snow Day for the first time and Manali ranks among 100 places the world over where this day is being celebrated. 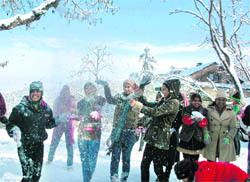 People braved the freezing chill and celebrated the day at Manali today. Marred by a heavy spell of snow and a muddy slushy Mall, the five-day national Winter Carnival today turned out to be “a carnival of formality”. It got a body blow as the carnival procession could not take off from the Hidimba Devi temple at Dhungri as the road was blocked due to snow. The state government has urged the Centre to provide a special package to Himachal Pradesh for strengthening the health services. Members of the local Bar Association today launched a stir by observing a one-hour token strike in support of the demand of district status to Nurpur subdivision. They also resolved to continue their one-hour strike indefinitely. Braving inclement weather conditions, CPM activists today staged demonstrations across the state to protest against the closure of 108 ration shops, increase in electricity tariff and exorbitant cement prices, making it extremely difficult for people of the state to make both ends meet. Commuters will not have to buy tickets daily for travelling in local buses in the city as the state road transport corporation has decided to put in place the smart card-based Automated Fare Collection System (AFCS). The people should come forward in a big way to learn methods and systems to meet challenges of sudden emergencies and take interest in learning practices to face various situations for saving not only their own lives, but also of others by helping them in time of need. It is after 2005 that the town has received such a heavy snowfall. Though it has been snowing and raining intermittently for the past two days, locals were in for a surprise when they woke up to see the town under a while mantle. Hoteliers, travel agents and porters were the happiest as tourists thronged the town as the news of the snowfall trickled out. Attendance in offices was thin and those who arrived were late as they trudged the entire distance. Schools and colleges are already closed for the winter vacation. While the Jakhu area received over 1 ft snow, lower areas received about 26 cm. The mercury further dipped to minus 2.9°C with most other parts of the town also recording a decline of almost two degrees in temperature. It is probably for the first time in the past 50 years that the Jubbar Hatti airport received 7 cm of snow. Both locals and tourists enjoyed the weather by playing in the snow and making snowmen. However, the supply of essential commodities was badly hit as vehicles carrying newspapers, milk, bread and other goods could not reach the town. In fact, night buses bound for the state capital were stranded at Kaithlighat and it was only after 9.30 am that the road was cleared for vehicular movement. It was late in the afternoon that newspapers and milk became accessible. The staff of the Electricity Department had a tough time restoring power supply as wires got snapped due to the weight of snow and broken tree branches all over the town. Many localities, including New Shimla, Vikasnagar, Sanjauli, Bharari and the Longwood area, remained without power. A heavy rush of tourist vehicles resulted in a traffic jam at the bus stand and near the Lift. Though the PWD had cleared Cart Road by 10 am, it was only in the afternoon that a few buses started plying. “We have engaged two JCBs and some labour to clear main roads and provide access to all hospitals,” said MP Sood, Commissioner, Municipal Corporation. Traffic to most parts of upper Shimla came to a complete halt due to a heavy snowfall at Kufri, Mashobra, Kharapatthar and Narkanda. Several buses of the HRTC have been stranded at different stations due to the heavy snowfall, affecting services. Traffic on the Rampur-Kinnuar route is, however, through as buses are going via Basantpur. “The vehicular movement on the national highway has been restored with the National Highway Authority of India, the JP group and the GREF clearing the snow,” said Sunil Chaudhary, Deputy Commissioner, Kinnaur. While Manali received 19 cm of snow, Kalpa had 8.8 cm, Keylong 7 cm, Theog 25 cm and Salooni 12 cm. “There is a likelihood of more snow and rain in the higher hills, including Shimla, while there are chances of rain in the mid and lower hills,” said Manmohan Singh, Director, Meteorological Centre. The Shimla region had not received much snow over the past two days during the current spell as the focus of the western disturbance remained more towards the Kangra, Chamba and Kullu areas. However, the heavy snow over the past 12 hours has more than made up for the deficiency. The blizzard which lashed the region in the wee hours of the day left the Jubbal, Rohru, Chopal and Narkanda areas under a 100 to 120 cm thick blanket of snow. 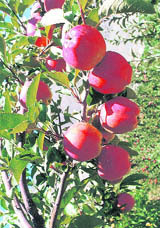 The region accounts for 75 per cent of the state’s total apple production. Last year there was no snow and the crop failed. Giri Bahadur of Sharontha village in Rohru, located at 7,000 ft, said it had been snowing for the past three days and the entire area was covered under over 3 ft of snow. He was quite pleased as the snow will ensure a good apple crop and plenty of water during the lean summer months. The Hatu peak overlooking Narkanda and Churdhar had 5 to 6 ft of snow. The Shimla region has not been receiving much snow in January in recent years and it was the heaviest snowfall since 2005 when over 100 cm snow was recorded in the apple belt during the month. In fact, since 1990, when there was 151 cm of snow in January, such heavy snow has been experienced only twice, in 1993 (109 cm) and 2005. With the mercury hovering below the freezing point, the discharge in the Sutlej dipped to 70 cumecs (cubic metre per second), brining down generation in the country’s largest Nathpa Jhakri project to a meagre 7 million units. The normal discharge during this time of year is 85 to 90 cumecs. The state electricity board’s own generation also plunged to the lowest at 22 lakh units (LU) per day as against over 100 LU during the peak summer. With the peak demand touching 250 LU, the board has been forced to procure 70 LU of power per day, besides the 70 LU being supplied to it by the government from its share as royalty in various projects. The 300 MW Baspa project is generating only 10 LU, the 126 MW Larji 8 LU and the Sanjay Vidyut Yojna 5 LU. The refusal of Punjab and Haryana for counter-banking arrangement has added to the woes of the board as it has increased the shortfall by 30 LU. The outages due to breakdown of power lines following heavy snow in various parts of the state has provided some reprieve to the board; otherwise it would have had to purchase 15 to 20 LU of additional power. With most parts of the state under snow, the demand for power is likely to stay high during the month. A minimum temperature of minus 1 degree Celsius was recorded at Solan while the maximum hovered around 12 degree Celsius as people witnessed one of the coldest nights of this season. A total of 13 mm of rain was witnessed in Solan. The hill resort of Chail donned a white mantle this morning and more snow followed in the evening. With power and water supply being hit, hoteliers were facing problems in arranging the basic amenities for tourists. 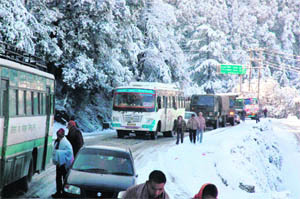 The presence of snow made the roads slippery, deterring the tourists from reaching Chail though machines were seen clearing the roads of snow. There was a beeline of holiday revellers visiting Kasauli and other places like Barog and Chail from the nearby Chandigarh. “It is after several years that such a heavy snowfall has been witnessed in Chail, but the lack of power and water since last night is making life difficult in this extreme cold,” said a hotelier, Devinder Verma, from Chail. The SE, Electricity, Anup Dhiman, said some problems were faced in supplying electricity in Chail and Solan due to transformers developing some snags, but repair work was under way to restore the systems. In the neighbouring Sirmaur, higher reaches like Haripur Dhar, Nohradhar, Ronhat and Sangrah also witnessed snowfall, which affected telephone, power and water supply with as many as 45 panchayats remaining cut off from the rest of the district. The Solang ski resort, which was the venue of the World Snow Day function, recorded 1.2 metres of snow till today. The Manali-Solang road up to the south portal of the Rohtang tunnel was opened by heavy machineries of the project authorities, but the movement of smaller vehicles was a little bit risky, said PK Mahajan, Chief Engineer of the Rohtang tunnel project, who was at the camp office at Solang. Mahajan (75), who hails from Kangra, said it was for the first time since 1952 that Kangra had experienced snow and many parts of the state were covered under snow. Roads in Karsog, Seraj, the Snor valley and Barot in Mandi district remained blocked and electricity supply snapped due to the snow. “It is still snowing here and we have recorded over 2 ft of snow. We have no electricity and water pipes have frozen. Besides, all roads are blocked,” said Jagdish, a resident of Janjheli in Mandi district. However, the Lahaul valley recorded just 4 inches of snow till today, said Suresh, a resident of Udaipur in Lahaul. “We have electricity, water and our children are going to school as it is not very chilly,” he added. Locals attributed the failure of the chief guest, Chief Minister PK Dhumal, to inaugurate this festival as a divine retribution as the festival date is decided not as per the diktats of Hidimba Devi, the presiding deity of the upper Kullu-Manali valley, but as per the convenience of VVIPs. Though the Chief Minister could not come due to bad weather and snowfall in the valley, BJP chief Khimi Ram and local MLA Govind Thakur presided over the function that started around 5 pm at Ram Bagh when most of the people had left for home in the freezing chill. The Winter Games at Solang Nullah could not take off today though these were formally kicked off by Khimi Ram in the presence of Govind Thakur, Kullu Deputy Commissioner BM Nanta, chairman of the Winter Carnival Committee, Manali SDM Balbir Thakur and Kullu SP Abhishek among other officials. The silver jubilee function of the Manali Hoteliers Association was a formality as most of the members deserted the venue before Khimi Ram could arrive at the Club House where the function was organised. The procession started from the Circuit House and not from Dhungri after Khimi Ram and Govind Thakur performed puja at the Hidimba Devi temple by walking up to the temple in 2 ft of snow. The procession consisted of a fascinating tableaux displaying tradition, culture, arts and the way of life of local people from the Kullu valley and also other parts of India. Hundreds of artistes of local mahila mandals, yuvak mandals, the Border Roads Organisation, HP State Electricity Board and NGOs also participated in the carnival. The Manali Mall turned into a foot-deep muddy slush due to the debris dug up by the ongoing construction work on the Mall. A VIP got stuck in the mud and was helped out by his scouts during the procession that turned out to be a mere formality. Nanta said nobody could fight nature, but all the formal ceremonies were completed. The date was decided by the committee and more than 23 cultural troupes from different parts of the country were participating in the carnival and they would perform during the rest of the days, he added. State Health Minister Rajeev Bindal met Union Health Minister Gulam Nabi Azad in New Delhi today and impressed upon him that being a small hill state with limited resources, Himachal needed special dispensation from the Centre. Bindal said the state had been able to reduce the Infant Mortality Rate (IMR) and increase institutional deliveries as evident from the Sample Registration System (SRS) 2010 data. The IMR had come down to 40 from 45 to 46 in 2009. He said this was made possible due to the implementation of various health-related schemes like the Matri Sewa Yojna, Janani Suraksha Yojna and Atal Swasthaya Sewa. He said in rural areas, the IMR had been low as compared to the overall figure of the state. Institutional deliveries had increased to 70 per cent and the female foeticide rate had also declined due to various initiatives taken by the government. Bindal said the “Beti Hai Anmol” scheme was making a positive impact. Free institutional deliveries and medical aid was also being provided in government hospitals to mothers and newborns till one year from birth. He added that the state deserved a special package as it had registered a maximum decrease in the IMR and had been successful in implementing the National Rural Health Mission. Bindal also met the Secretary, Health, Government of India, and demanded a special package for the state. While submitting a memorandum to Chief Minister PK Dhumal, the association urged him to grant district status to Nurpur as people from far-off places in Nurpur and Jawali subdivisions had to travel 24 hours in to reach district headquarters at Dharamsala. It held a plea that granting of district status to Nurpur subdivision was the oldest one. The association also resolved to educate the masses to bring awareness in them in this connection and undertake a signature campaign too. People turned up in large numbers to join the protest rally outside the Deputy Commissioner’s office here today. The rally was addressed by member, state secretariat, Tikender Panwar, Sanjay Chauhan, Kuldeep Tanwar and Onkar Shad. 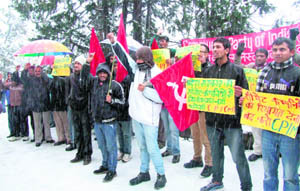 Rakesh Singha led the demonstration in Theog amidst heavy snowfall and Kushal Bhardwaj at Jogindernagar. The protest on three main issues affecting the common man were held at Theog, Rampur, Rohru, Bhawanagar, Shimla, Arki, Solan Parwanoo, Nahan, Nauradhar, Paonta Sahib, Una, Dulehar, Tarsooh, Kangra, Palampur, Baijnath, Dharamsala, Chamba, Mandi, Jogindernagar, Jhanjheli, Sundernagar, Balh, Kullu, Anni, Nirmand, Manali, Hamirpur, Bilaspur and other places. A memorandum addressed to Chief Minister PK Dhumal was also submitted during the demonstrations. Addressing the gathering outside Naaz here on the Mall, the speakers, including Sanjay Chauhan, Vijender Mehra and Tikender, castigated the state government for playing with the interests of people of the state. “Though the state is rich in hydro potential and has a huge potential of producing cement, still people have to pay the highest price for cement and consuming electricity in the state,” they said. “All arguments that it is the freight cost that increases the price are lame excuses as crores of rupees have been taken as transport subsidy by cement companies,” they said. The speakers ridiculed the government for closing down 108 ration shops that do not qualify the sales of Rs 5 lakh per month, thereby snatching the basic right of subsidised food from the common man. The CPM warned that in the second phase, the movement would be intensified as some more organisations, political parties, progressive forces and individuals would be roped into make it a decisive struggle. The project is part of an initiative taken by the Union Ministry of Urban Development under which a single micro-chip-based card will enable the people to use the rapid transport facility. The ministry has granted Rs 1.69 crore for the purpose to the corporation under the Jawaharlal Nehru National Urban Renewal Mission (JNNURM). The automated revenue collection system facilitates the purchase of pre-paid tickets and their subsequent use through electronic systems to permit access to buses. Besides a central control centre, GPRS connectivity-based sub-systems will be installed in all 75 buses provided under the mission. The commuters will only have to swap the pre-paid smart card at the rear door of the bus on boarding and the front door while alighting. The chip on the card will help calculate the distance travelled and the amount payable will be deducted automatically. The Centre had provided 15,260 buses to 61 cities across the country, but the system has not been installed anywhere so far. The buses are already three-year old and by the time the system is put in place, many of the vehicles will have completed their life, which is around six years. The AFCS reduces the need for ticket checking staff and helps prevent pilferage. It minimises on-board ticketing, makes accounting of revenue collection easy and generates vast information for improving the transport system. It also ensures efficiency in the operation of bus services as the vehicle tracking system is an integral part of the intelligent transport system. The corporation has recently submitted a Rs 60-crore proposal to the Centre for the purchase of 400 more small and big buses of different seating capacities to further strengthen the transport services in and around the state capital. The chances of securing funds are minimal as the Urban Transport Management Scheme under the JNNURM is closing in January and most of the funds have already been allocated. This was stated by Deputy Commissioner Ritesh Chauhan while inaugurating a three-day “Aapda Prabhandhan Shivir”, organised by the Gayatri Parivar at its head office complex here today. Chauhan said such training camps could be of great help and provide safety, succour, solace and timely assistance to those persons who get entrapped in unexpected situations during natural calamities like floods and earthquakes and accidents. He appreciated the camp and another scheme of the Adarsha Gram Vikas Yojna of the Gayatri Parivar, which would be beneficial for villages that would be adopted by the parivar. Commandant, Home Guards, BS Chauhan gave a demonstration and training to senior citizens and others present from various parts of the district, including Gehadwin, Barthin, Ghumarwin and Parnaal. Gayatri Parivar district convener Ramesh Tandon and mukhya parivrajak Onkar Singh Thakur also addressed trainees and gave details of the Model Village Scheme. They said the parivar would adopt some villages to abolish evils like drug abuse and addiction to intoxicants, and maintaining sanitation and cleanliness, inculcating in children the habits of self-confidence, self-help, discipline and obedience.